Usually when people discuss alternate timelines it involves sweeping events in our planet’s history. What if the Axis won World War 2? What if the Inca had lightning guns? But not Nerdy Show, at least not this time! 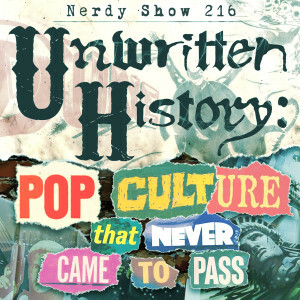 No, in this episode we devote our parallel world perusing to unreleased pop culture projects: amazing films, games, and comic books that were developed but remain incomplete to this day. Join Cap, Doug, Josh, La Valle, and Tony as we lament unmade movies from some of our favorite directors – Kubrik, Lynch, Fincher, Gilliam, and many others with ideas too big for Hollywood to handle. We share the strange stories leaked from behind the scenes of all the magic that almost got made. And of course, for every amazing project that doesn’t go forward, there’s plenty others we’re glad never saw the green light! We discuss those too alongside tragically cancelled video games, woefully mangled animation, and even an album lost to the sands of time. Thanks to AntiLuke for the episode topic! There's a new Doctor in town!